Join us for a delicious three course lunch with tea or coffee in this popular restaurant in Woburn. You will be welcomed on arrival at 12 noon with a refreshing glass of bubbly. We look forward to welcoming you to a three-course lunch with tea or coffee in this popular restaurant in Woburn. A refreshing glass of bubbly will greet you on arrival at 12 noon. 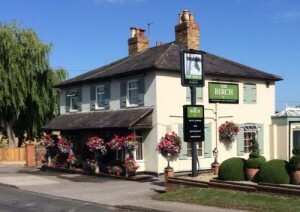 The Birch is a family owned bar/restaurant on the outskirts of the historic town of Woburn, just 15 minutes from Milton Keynes. They are passionate about serving quality fresh food accompanied with specially selected real ales and a fantastic choice of wines in a comfortable, modern environment served by their attentive and friendly waiting staff. As you walk through the front door you’ll be welcomed by the comfortable and contemporary bar with its red walls, slate top bar and strategic lighting creating the perfect place to relax and unwind with friends and family. We shall need your menu choices in advance, so the menu is shown below. Just take your pick and let us know your choices by 18th March please and let us know if you have any special dietary requirements.